Only in Poland high-carbohydrate supplement, which contains up to 10 protein sources of varying absorption. Rich in high doses of BCAA and EAA and glutamine! Incredibly refined tastes! LIMITED VERSION - 7.7 kg !!! 225 loyalty points Your cart will total 225 points that can be converted into a voucher of 9,00 PLN. LIMITED VERSION - 7.7 kg !!! PVL MUTANT MASS is the best conditioner for the mass market! For many years, he holds a leading position among gainerów. The extraordinary popularity is no accident. The strongest anabolic formula that allows each rapid increase in muscle mass and strength. The composition can find high-quality Waxy MAIZE carbohydrates with a high degree of complexity, as many as 10 full-value protein sources having different speeds absorption. 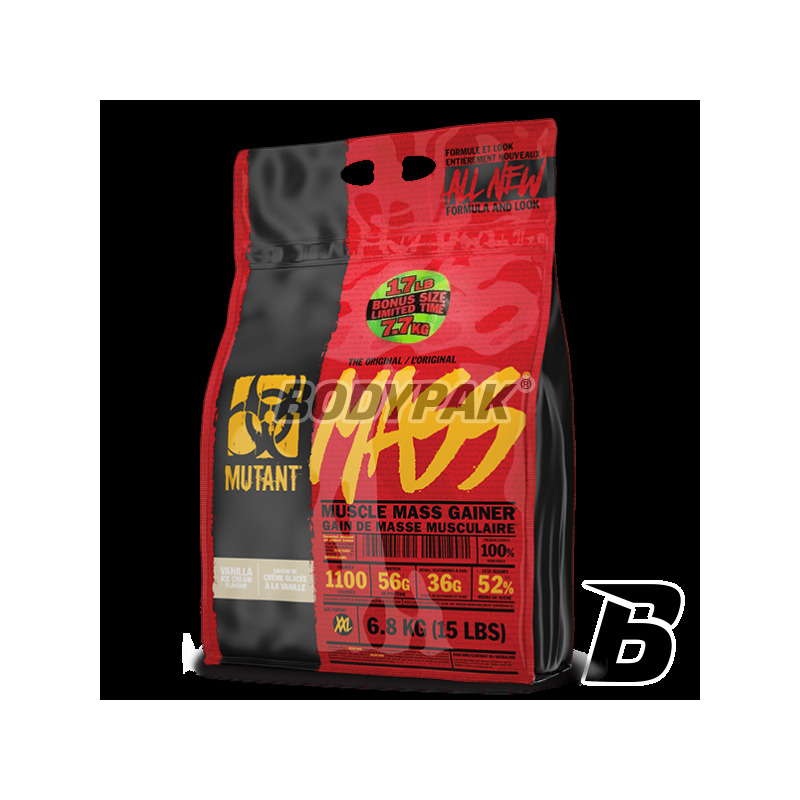 Each serving will provide you with a constant supply of nutrients that up to accelerate the development of your muscles! In addition, the product is rich in sources of CLA, kawasów omega 3 and 6 (a complex of healthy fats) but also the BCAA and EAA. As you can see this is not the case - MUTANT MASS is simply the result of many years of experience and expertise. Here there is no room for pretense and compromises, this product works! PVL MUTANT MASS is the product breakthrough, which have experienced many athletes (both professional and young students of bodybuilding). Fast muscle mass is at your fingertips! To this were not enough, the manufacturer took care of every aspect - also about taste. Amazing sensory experience will make you can not wait for the next batch of your favorite conditioner. Supplement is to work - yes, but why can not simultaneously delicious taste? Even in this respect there is no compromise! MCT - a complex of fatty acids having an average chain length. An excellent and easily accessible source of energy, there is no storage in the form of fat, stimulates the secretion of m.in . : growth hormone and insulin, exhibits anabolic and anti-catabolic. CLA - conjugated linoleic acid. Originally classified as a antnowotworowy, supporting the immune system collapses to viruses and reduces allergic reactions. Later it was found that CLA has the ability to prevent lipogenezie (storage of fatty acids in the adipose tissue) promotes anabolic processes leading to muscle mass, increase lipolysis (breakdown of fat) and increases thermogenesis (amount of power discharged in the form of heat). All this leads to a degreasing and improve the overall firmness of the body. Flaxseed oil - rich in Omega 3, 6, 9 and Ling (bioactive plant hormones). Effectively lowers cholesterol, helps the digestive system, protects the nervous system and improves the use of calories from food. Colostrum - the food received by the child from the mother at the beginning of your life. Contains compounds support the immune system, accelerating growth and development. Whey protein hydrolyzate - a protein subjected to preliminary digestion of the enzyme. As a result, they absorbed almost instantaneously, providing the body with the necessary building compounds (amino acids). Calcium caseinate - is characterized by the most steady release of amino acids into the bloodstream of all protein sources, and thus works best during the long breaks between meals, effectively stopping catabolism for hours. Albumin egg- widely regarded as a model protein - has an amino acid profile that best suits our body by the use of the construction of the muscle tissue (biological value BV = 100). Milk Protein Isolate - all the best of milk without undue lactose, cholesterol and saturated fatty acids. It contains Conjugated Linolenic Acid (CLA, a compound useful in reducing the amount of fat stored by the body as fat), Glutamine peptides (very important amino acid) or are lactoferrin (best absorbed iron, has a strong antibacterial properties). A mix of carbohydrates - Waxy MAIZE (corn starch), Maltodextrin. They provide the body with the supply of high-quality "fuel" for a long time. They help rebuild glycogen stores provide facilities for energy processes and changes taking place in our body. Proper selection of blend components reduces the risk of accumulation of excess carbohydrates in the form of fat stores. 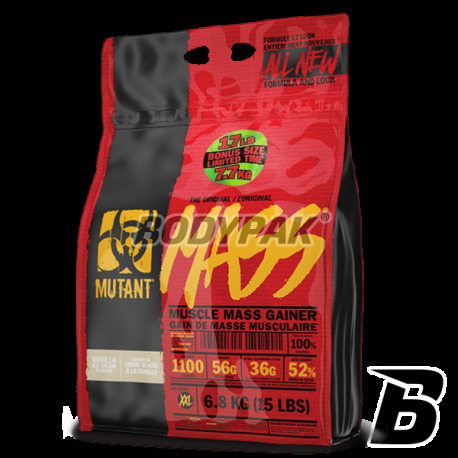 SO EASILY BE NOTED THAT THE MUTANT MASS WILL ALWAYS PERFECT CHOICE THEN WHEN YOU NEED TO PROVIDE THE HIGHEST QUALITY body NUTRIENTS. ATTITUDES TO THE HIGHEST QUALITY AND EFFICIENCY! FAST WEIGHT AND MUSCLE STRENGTH titanium is at your fingertips! najlepszy gainer dostępny na rynku wysoka wartość składników odżywczych , szybki przyrost masy mięśniowej , jestem bardzo szczupły i w ciągu 2 miesięcy skoczyłem 11 kg w górę konkret sprawdza się jako zamiennik posiłków miód malina !! !